Many a time I have been doing an Arduino project and thought it would be awesome to visualise the data that the various sensors are recording live. I’m aware that some dedicated scripts for both Processing and Arduino exist for this but I found that they were very restrictive and designed for use in isolation. The aim of this tutorial was to show you how to implement your own version which can be integrated into a processing control GUI or your current data transfer protocol between Arduino project and Processing script. This is entirely up to you and can vary from no more than connecting the arduino to your computer to a fancy sensor setup. I chose to use a HC-SR04 ping sensor because I had a nice board pre-soldered from the Trampoline Bounce Counters I had made! The first stage was setting up the Arduino to send a single integer value when requested by the processing script. I prefer to send the values as binary data because it requires much less data transfer than if sent in ASCII format. At this point you should wire up your chosen sensor to your Arduino and test it in isolation. If you are feeling lazy you can simply use a floating analog pin! 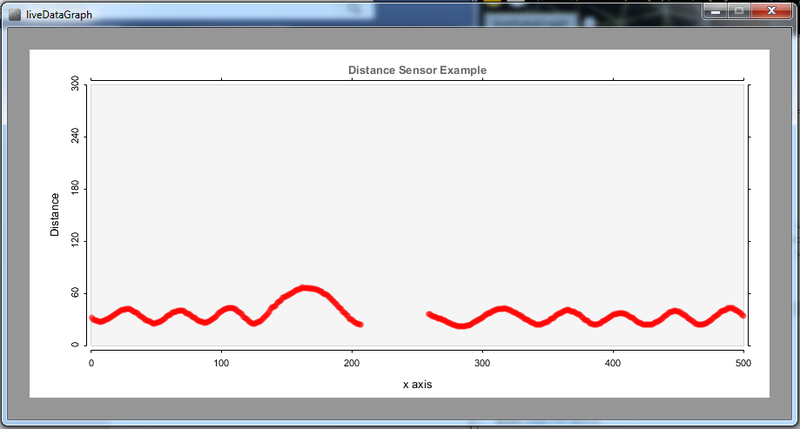 If you choose to use your own sensor make sure you allocate the readings to an integer called value as I have done. If you were feeling lazy just comment out the ping sensor lines and un-comment the floating analog input line. The remainder of the method is focused on the processing script running on your PC. The first step is to download the Grafica library which makes graphing in processing a very simple process. This two way and the instructions on how to do so are here. #define TRIGGER_PIN 4 // Arduino pin tied to trigger pin on the ultrasonic sensor. #define ECHO_PIN 3 // Arduino pin tied to echo pin on the ultrasonic sensor.